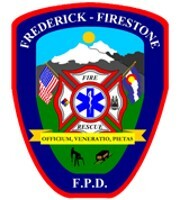 Frederick-Firestone Fire Protection District (FFFPD), founded in 2001 covering 30 square miles in Weld County including the towns and areas of Angel View, Booth Farms, Boulder Creek, Coalridge Ditch, Country Meadows Farm, Countryside, Del Camino, Del Ray, Firestone, Firestone Lake, Fox Run, Evanston, Harney, Hart Memorial Park, Lower Boulder Ditch, Lyons Park, Milavec Lake, Monarch Estates, Morningside, Noname Creek Estates, Oak Meadows, Prairie Greens, Ridge Crest, Rinn Valley Ranch, Saddleback, Savannah, Spindle Oil Field, St. Vrain State Park, Stanley Ditch, Sterling Mine & Summit View. Frederick Volunteer Fire Department was first organized in 1915. In 1976, the residents of a nine square mile area voted to form the Frederick Area Fire Protection District. In 2001, the name changed to the Frederick-Firestone Fire Protection District. Frederick-Firestone Fire Protection District is part of the North Area Technical Rescue Team. Frederick-Firestone Fire Protection District is dispatched by Weld County Regional Communications Center.